“Something that is fun as well as necessary” is the way that Samantha Eve describes her successful cupcake business, Violette Bakeshop — but it could also describe her other indispensable passion, the Out of the Box Theatre Company, which she founded in 2010 and that brings essential musical theatre productions to this city that we would not otherwise get the opportunity to see. I find it kismet that on her right arm there’s a colorful and striking tattoo of a whisk and a rolling pin, and on her left there’s another that says “Make Good Art.” “Theatre’s a consuming career that is competitive and challenging,” she tells me. “When baking I can do something that I’m passionate at — just as much as theater.” Since Out of the Box’s inception, Samantha has produced and directed groundbreaking productions ranging from Spring Awakening to The Wild Party. This coming Halloween, she will bring The Rocky Horror Show to Center Stage Theatre for a week. Samantha grew up in Goleta, the daughter of Occhiali Eyewear owners Salli and Irwin Eve. Her parents still live in the same house she grew up in. She went to the Anacapa School for middle school and high school and remembers her graduating class being only eight students. “It was an intimate and creative experience to grow up in,” she recalls. 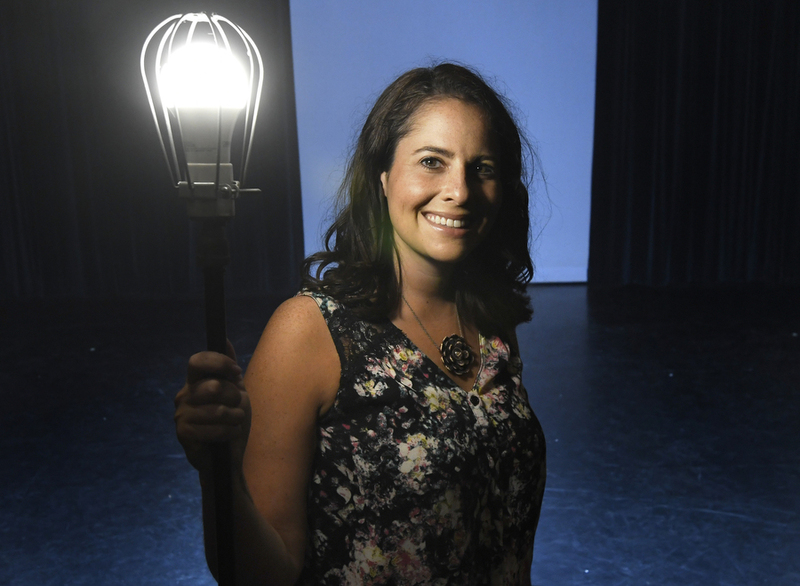 She started doing children’s theater when she was 7 years old, taking dance classes at Santa Barbara Dance Arts and participating in youth programs such as Showstoppers Theatre, Santa Barbara Youth Ensemble Theatre, Stage Left, Rubicon Theatre Company, and Idyllwild Arts Academy’s summer program. “I grew up watching movie musicals like West Side Story,” she tells me with a smile. She was accepted at the prestigious New York University Tisch School of the Arts to study musical theater. After graduation, life in New York proved to be expensive and hard. Samantha’s creativity was challenged by auditions and the inevitable rejections that all actors experience. In 2010, she decided to return to Santa Barbara, certain that she was not going to do any more theater. That decision lasted a year. Then she started Out of the Box Theatre Company. “With my baking and Out of the Box, I get a lot of fulfillment,” Samantha says. “It requires a lot of ‘can-do’ attitude.” Out of the Box is a nonprofit organization, and it’s also basically a one-woman operation. Samantha directs, produces, designs the costumes, and even puts up posters around town. She’ll be selling her cupcakes at the French Festival this upcoming weekend at their wine and beer booth, and all the profits will be going to Out of the Box. Samantha’s father, Irwin Eve, has previously answered this questionnaire. This is the first time I’ve had a father and daughter as subjects. Her questionnaire also marks the fourth anniversary of this column. It’s been an incredibly rewarding experience. I’d like to acknowledge my editors, Matt Kettmann and Charles Donelan, and photographer extraordinaire Paul Wellman for making this such a fulfilling project for me. Here’s to everyone who has been willing to answer Marcel Proust’s wonderful questions. We truly do live in a beautiful and thriving community. Samantha answers the Proust Questionnaire. Appreciating little, perfect moments. Sitting on the beach on a sunny, warm day with a book in hand. Breezing through 10 blocks and only hitting green lights. A large cup of coffee. I’m not always able to take that necessary moment to step outside myself and stop worrying about whatever is going on in order to appreciate these moments, but I make a conscious effort. A little scattered, but happy. I’ve accepted at this point in my life that I’m never going to be blissfully serene and relaxed, in a state of catatonic calm… although I do attempt yoga occasionally, which can help quiet my thoughts. I like to keep busy and tend to juggle multiple projects at a time — not because I don’t know how to say no, but because I’m so thrilled and excited to try new things and work with new people. In addition to preparing for Out of the Box Theatre Company’s next season, I’m about to start working on a play for On the Verge Summer Repertory Company that I’ll be directing (to be performed this August at the Community Arts Workshop). I love that it allows me to be creative. Out of the Box Theatre Company gives me the means to create visuals and tell stories, and to share those stories with the rest of the Santa Barbara community. It’s wildly rewarding, in that sense. To me, theater is about finding connections and sharing stories that explore the human experience, and it’s amazing to be a part of something like that. Melissophobia, also known as fear of bees. Yes, I know they’re good for the environment, but they also killed Macaulay Culkin in My Girl, so you know… not a huge fan. My parents. I feel like everyone thinks their parents are the best, but honestly, I don’t know anyone else in the world who works as hard as they do, or loves as deeply and unconditionally. They’re wonderful and I’m lucky as hell to be their daughter. Probably LUSH bath bombs. I only purchase them once in a while, but they’re just one of those small non-necessities that have the ability to make a less-than-stellar day feel sort of special. Plus, there’s something fun about taking a bright, electric-blue bath. What is the quality you like most in people? What is the quality you dislike most in people? Reliability. I like to be around people who I can count on to follow through — walking the walk, not just talking the talk. Creativity, I think. I enjoy making things — DIY is my jam. When I’m not in rehearsal for some show or another, I’m baking cupcakes, decoupaging a thrift-store coffee table, or trying to teach myself how to tie fancy knots for a macramé wall hanging. I use “like” a lot. And “literally,” which is even worse because it’s like, literally always misused. I’d love to be able to paint or draw… I mean, to do it well. Honestly, I’m terrible with anything more complex than stick figures. I wouldn’t mind being a couple of inches taller so I could reach things at the grocery store without having to scale the shelves like a rock climber. Building Out of the Box Theatre Company and keeping it running for seven years. I’ve always known I wanted to be involved with theater, but even when I was studying musical theater in college, I never imagined I’d be interested in directing or capable of creating and maintaining a theater company. I’ve learned a lot since founding Out of the Box, and it’s something I’m very proud of. If money were no object, I’d split my time between Santa Barbara and New York. And maybe Hawaii. Still, Santa Barbara makes a fantastic home base. I love to travel whenever I can swing it, and even though I’ve been fortunate enough to see some great places, it’s always nice to return home when home is Santa Barbara. I’ve never been an especially sentimental person when it comes to my possessions, but there’s a sand-dollar necklace purchased in Maui that I’m really attached to. I’ve had it for nearly 20 years now. I thought I lost it earlier this year and tore my house apart looking for it — thankfully, I found it! My friend Haley does a Game of Thrones–themed podcast called “Drinking Game of Thrones” that never fails to crack me up. Also, fainting goat videos. This is a tough question! I don’t know that there’s one particular historical figure I identify with, but I have the utmost admiration for the women in history who have worked to pave the way for women in the arts today. Margo Jones (“The Texas Tornado”), Zelda Fichandler, Vinnette Carroll… you don’t hear their names all that often, but their stories are inspirational. If it’s absolutely necessary to spare the feelings of someone I care about.